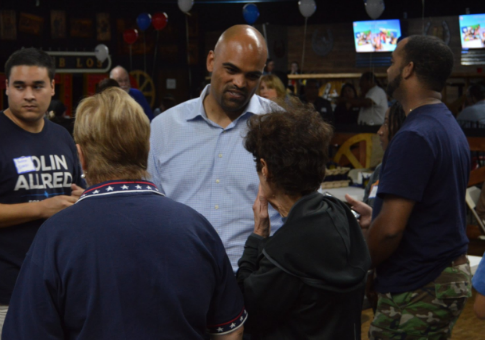 Colin Allred, the Democratic nominee for Texas' 32nd Congressional District, promised in his latest ad not to be a "party-line politician," despite accepting political contributions from House Minority Leader Nancy Pelosi (D., Calif.) and her political action committee. In "My Story," an ad released by Allred's campaign on Monday, the candidate said that he will be "an independent voice for North Texas, not a party-line politician." However, Pelosi and her PAC, PAC to the Future, have already given big donations to Allred totaling $14,000. Allred's campaign is also on track to benefit financially from House Majority PAC, a liberal Super PAC dedicated to electing Democrats. The organization is expected to spend $2.2 million on TV reservations in the Dallas-Ft. Worth, Texas, media market in the final weeks leading up to Election Day in November. The National Republican Congressional Committee castigated Allred for his ad, saying that he will be a "loyal foot soldier" for Pelosi if elected. "Despite what Colin says, it's not that difficult to connect the dots," said NRCC spokesperson Jack Pandol. "Nancy Pelosi is doing everything she can to buy Colin Allred's ticket to Congress because she knows he'll be a loyal foot soldier for her agenda." In addition to support from Pelosi, Allred's campaign has received more than $41,000 from Swing Left, a group dedicated to aiding Democratic politicians in swing districts. Some of the top donors to Swing Left include liberal billionaire George Soros, who has donated at least $50,000 to the group, and Hillary Clinton's political action group, Onward Together, which has made multiple donations totaling $120,000. Allred, who was added to the Democratic Congressional Campaign Committee's "Red to Blue" program earlier this year, is facing Rep. Pete Sessions (R., Texas) in the general election. This entry was posted in Politics and tagged 2018 Election, Democratic Donors, NRCC, Super PACs, Texas. Bookmark the permalink.